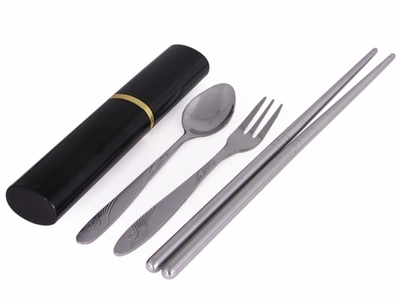 Made in China, this travel chopstick utensils set comes with a stylish black plastic case with gold rim in the center. Included in this travel chopstick set comes a pair of collapsible stainless steel chopsticks, which simply need to be screwed together. Along with this set also comes a miniature stainless steel fork and spoon, which makes this travel chopstick set ideal for use for any type of food. Bring along to work in your purse, suitcase, or even pocket as the small compact size can fit anywhere.